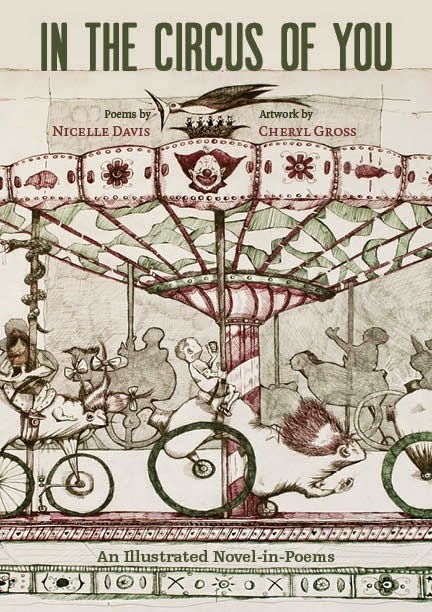 We're excited to give you a preview of the cover of our spring release, IN THE CIRCUS OF YOU: An Illustrated Novel-in-Poems by poet Nicelle Davis and artist Cheryl Gross. The cover features artwork by Cheryl Gross and was designed by Heather Butterfield. The book launches in March. Subscribe now to be among the first to receive a copy! Preordering will begin in February. "Nicelle Davis' newest book mythologizes pain, makes grief, anger, disgust, and fear bearable by transforming them into finely wrought poems. These poems are filled with sharp edges, dissections, illusions, and images of flight, both in their language and in the ways they occupy the page. They are perfectly matched by the drawings of Cheryl Gross, who translates Davis' poetry into an equally grotesque, equally eloquent visual language. In the Circus of You is a visceral spectacle of controlled excess; it dismantles the three rings we use to contain our most domestic horrors and shows us the way through vulnerability to release."